After being confined to an audio-only experience for over two years, Amazon’s Alexa assistant was finally given a screen with last year’s Echo Show, a blocky combination of a tablet-sized display and smart speaker. The original Echo Show was the first of its kind: a smart display, powered by an intelligent assistant, that could do more than just play music and set timers, it could show you the name of the song and the timer counting down, too. In the year and a half since, other assistants have gotten displays of their own. So now Amazon has released a new Echo Show, one that addresses some of the faults of the original and improves upon the idea, without completely reinventing it. The new Echo Show has a bigger screen, better speaker system, and a nicer design. It’s also running new software that’s prettier and easier to interact with, though the new software will also be coming to the original Echo Show and the Echo Dot when the new model arrives on October 11th. The new model comes with all of these features without commanding a higher price: it’s available for the same $229.99 that the first Show sold for at launch. Despite these improvements, the new Echo Show doesn’t do that much more than the prior model, and if anything, it highlights where Alexa’s boundaries are. When Alexa is restricted to a speaker, it’s easier to accept that Alexa is only really good at a handful of things, all of which rely on sound: weather reports, music, alarms, timers, etc. But when a large, bright screen is added to the mix, the expectations go up. A screen should let me watch video from any source I want, and it should be able to display information that’s relevant to me no matter where it comes from. Unfortunately, the new Echo Show’s bigger, better screen still doesn’t fulfill either of those expectations. That all makes the new Echo Show a bit frustrating: it’s better to look at, better to listen to, and nicer to use, but it still can’t do all of the things I reasonably expect a big, internet-connected display on my kitchen counter to be capable of. The most obvious upgrade with the new Echo Show is its new display. Amazon has expanded the screen from a cramped seven inches to a 10.1-inch panel. Instead of sitting atop a speaker grille, the new Show’s display takes up the entire front of the device, and it’s much nicer to look at as a result. The display is bright and vibrant, with rich colors and good viewing angles. It has a glossy glass cover, which means it can catch a bad glare at the wrong angle, but otherwise there’s nothing to complain about with it. For what the Show does and how it’s intended to be used, the new screen works well and is easier to use than the prior model’s display. The other obvious hardware upgrade is with the new Show’s speaker design. It still has two 2-inch speakers, but they’ve been moved from the front of the device to side-firing positions and have been upgraded with neodymium drivers for better quality sound. The new Echo Show also has a passive bass radiator for much better low-end response. The result of these design changes and speaker upgrades is a much better sounding device than before. The side-firing positioning of the speakers allows the Show to fill a room with sound much better than before. The more powerful speakers produce greater volume, and the passive radiator gives the Show some bass you can hear and sometimes feel, which was lacking in the old model. Is it as good as a Sonos One or another high-quality speaker? No, not quite, and at full volume the sound starts to fall apart and distort. But it’s good enough at normal listening volumes that when I swapped the out Sonos One in my kitchen for the new Show to do this review, I didn’t miss the Sonos. It also sounds better than the Lenovo Smart Display that runs the Google Assistant. I also like how the new Show looks on my kitchen counter more than the old model or Lenovo’s design. The first Show had a “chiseled out of a block of plastic” industrial vibe, while the fabric cover on the sides and the repositioned speakers give this new one a softer, gadget-that-can-live-in-your-home appearance. It also takes up less space on my counter than the Lenovo, while still giving me the same size display. Even with the greater volume and better sound output, the Show still was able to hear my voice commands without any problems, even from across the room. Still, there are things with the Show’s hardware design that will bother some. If you aren’t comfortable with an internet-connected camera staring at you all the time (there’s a 5-megapixel camera in the bezel just above the display), you can disable it in the Show’s settings, but there’s no hardware shutter switch to block it, like you can on Lenovo’s Smart Display. (Some double-sided tape and a googly eye work well, however.) It’s also still a big thing to have sitting on your counter all the time, and if you have a small kitchen with limited counter space, you might have a tough time making room for the Show. Unlike an iPad, you can’t easily put the Show in a drawer when you’re not using it. More significant than the new hardware is the new software that’s debuting with this Echo Show. Amazon says it spent the last year-plus learning how its customers used the Show in their homes and has designed the new software in response to that. There’s more customization, more ways to use touch to interact, more ways to control smart home gadgets and Alexa routines, and more things to do with the Show’s display than before. There’s even a web browser now. Even with these additions, the interface is still very familiar, and if you’ve been using an Echo Show for the past year, you’ll feel right at home with it. Most of the interactions are still driven by voice commands, but certain things can now be done by touch, such as turning on smart lights or running an Alexa routine. The web browser (you can choose between Amazon’s Silk browser or Firefox) is operated entirely with touch control, though amusingly, the only way to launch it is to ask Alexa to “open [Firefox or Silk]”. The home screen has more customization options and presents things like sports scores in a nicer fashion that before. Largely, it’s just prettier to look at, which is important for a device that will be sitting on your counter, shelf, or nightstand all the time, displaying headlines and other bits of information. Swiping down from the top of the screen displays two new options: Lights & More and Routines, which let you control individual or groups of smart lights and run Alexa routines you’ve set up in the mobile app without having to use your voice. It’s clever enough to put the most recently used smart light controls at the top of the list, so if you always use it to turn the lights on and off in your kitchen, you don’t have to scroll through the whole list every time. There still isn’t a grid of app icons, however, so many of the Show’s capabilities can feel hidden or hard to find. Amazon says there are now over 1,000 “skills” (the company’s equivalent of apps in the Alexa world) that take advantage of the Show’s display, and if you ask Alexa to “show me skills”, you can browse through a variety of categories, including ones that are specifically designed to use the screen. Most of the suggested skills are for displaying new facts or quotes every day, which is a bit underwhelming. In all, I find this whole process to be tedious and cumbersome, and most of my usage with Alexa is with its built-in capabilities, such as smart home control, shopping lists, timers, and music, not through third-party skills. There are other features that I don’t find very valuable. That 5-megapixel camera lets you video chat with other Echo Show devices or anyone that has the mobile Alexa app on their phone, but this feature isn’t particularly compelling in my day-to-day use. The Drop-In feature that lets you start a video call on the Show unannounced is still here and still kind of weird, though Amazon now lets you limit it to just the people on your Amazon Household. Should you decide to use these features, the Show’s fixed viewing angle can make it hard to find the right position for a video call, though the larger display does make it easier to see the other person. That said, there are certain things that I really like with the Show. My spouse and I use Alexa’s shopping lists to organize our grocery shopping and sync everything with our phones, and the Show’s display is great for seeing what’s already on the list and checking things off as necessary. I can even add a whole slew of items to the list with just one command (i.e. “Alexa add milk, eggs, bread, cereal, and Oreos to my list”) and Alexa is now smart enough to parse each one out into individual items. I’m not exaggerating when I say this is the new feature I’ve appreciated the most. The Show makes it very easy to manage multiple timers when you’re cooking, which you can individually label and watch as they count down without having to ask Alexa for an update on them. The Echo Show is also great for controlling smart home gadgets like lights and outlets. The new model now has built-in Zigbee support (just like the Echo Plus speaker), so you can use it as a central smart home hub and connect lights and other devices to it if you want. But all of these things also work great with a standard Echo or Alexa speaker, and none of them really justify the presence of the Show’s screen. For that, we need to see what the Show can do as a video player. 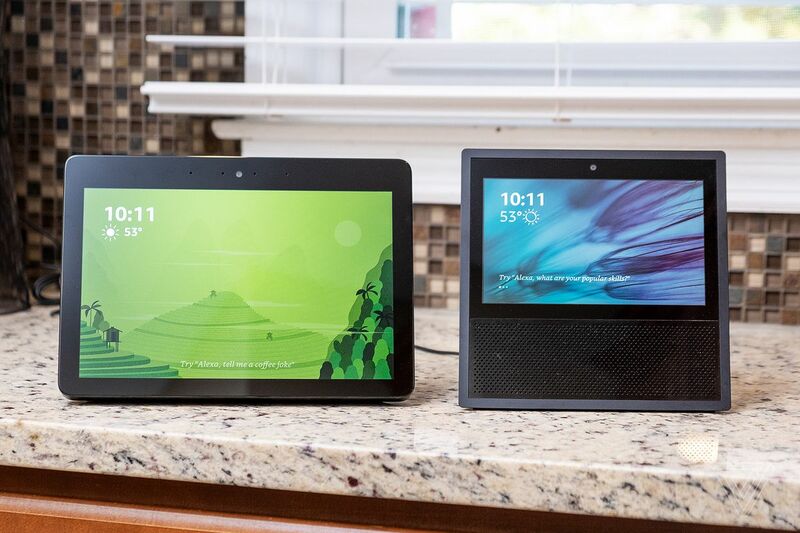 The biggest drama with the original Echo Show was the ongoing disagreements between Amazon and Google over whether the device should be able to have YouTube or not. Amazon had originally included a specially designed YouTube experience for the Show that Google blocked, and then Amazon tried another approach that Google blocked yet again. So, Amazon went back to the drawing board and came up with a way to get YouTube on its Echo and Fire TV devices without the risk of Google blocking it: it installed a web browser on them. Using the Show’s built-in Amazon Silk or Firefox browsers, you can navigate to YouTube.com with the on-screen keyboard or a shortcut button and search for and watch videos that way. There are many issues with this experience. For starters, the Show’s browsers can only display the mobile version of the YouTube website, which looks ridiculous on the Show’s display. Video quality from the stream is poor and low resolution, and there’s no way to play YouTube videos with a voice command: you must type in all of your searches with the on-screen keyboard. You also can’t cast YouTube videos to the Show’s screen from your smartphone, like you can do with Lenovo’s Smart Display. Still, if you really want to watch YouTube videos on the Echo Show, you can now do so. I just don’t think I’ll ever want to go through the hassle. You can link your Hulu account or watch NBC (with a cable subscription) on the Show now, which gives it a couple of more video options. The Show can also work with Ring video doorbells to display who’s standing at your front door and allow you to have a two-way conversation with them. It will even announce when the bell has been rung. Unfortunately, the Hulu, NBC, and Ring integrations were not available for me to test in time for this review, but Amazon says they will be available when the Show ships to customers. There’s also new integration with Vevo, so you can request music videos to watch on the Show. But asking for specifics can be difficult (the Show refused to play the music video for “Shallow (A Star is Born)” by Lady Gaga and Bradley Cooper, no matter how I phrased my request), and there really isn’t a way to casually browse popular music videos. Amazon says that “Alexa’s ability to understand music video requests on Vevo is going through optimizations” and it expects this to be improved over time. The Show is also still lacking many other video sources, such as Netflix, HBO, Vudu, and over-the-top TV services like DirecTV Now and PS Vue. Aside from the Hulu and NBC integrations that are coming, the primary source of video content for the Show is still Amazon’s own Prime Video service, which while expansive and full of good content and exclusives, is still only one video source, and likely not the most watched one in your home. On top of all of that, much of the time, the Show feels frustratingly isolated from my phone. It’s much easier to search for things like videos and recipes on my phone, which I wish I could then push to the Show’s larger display. But the only thing I can cast from my phone to the Show is Amazon Music or Spotify music (via Spotify Connect). Amazon has established Alexa as one of the top-tier virtual assistants, and even if you don’t use most of Alexa’s features, you can still find it to be a very useful assistant for the few things you rely on it to do. The Echo Show is a similar proposition: you probably aren’t going to use all of its features, but you may find those few things that it does well that work in your life. For me, that’s managing a grocery list, controlling smart home gadgets, getting weather reports, and listening to music. But I’d love to use the Echo Show for other things, like watching the latest season of Big Mouth on Netflix while I do the dishes. Or use as a digital photo frame for my Google Photos account. The Show supports Amazon’s Prime Photos, naturally, but none of my photos are stored there. It’d be great if I could just cast Doug DeMuro’s latest deep dive on an exotic car on YouTube from my phone to the Show, so I can have it on while preparing lunch. Aside from perhaps Netflix, which Amazon potentially could add in the future, I probably won’t ever be able to use the Echo Show for all of the things I want to use it for, because at the end of the day, it’s mostly an access point for Alexa and not a full-fledged computer platform. Without deals with all of the video content providers, such as Netflix and HBO, and personal data storehouses, like Google and Apple, Alexa can feel a bit lonely. While I do not expect the Echo Show to do the exact same things as my phone — the thought of an email app and Twitter on the Show makes my eye twitch — I would like to be able to use the Show in conjunction with my phone, to either share information between them or remotely control either one. There certainly are pros to Amazon’s isolated, simplistic approach – my colleague Dieter Bohn appreciated the Show’s simplicity compared to a tablet or PC when he reviewed the first model over a year ago. And the Show is not alone in its limitations: Google’s Smart Displays have similar gates around what services they support and what features they have (and they don’t support Netflix either). The advantage Google has, however, is it already is a giant storehouse of my personal data, which Amazon is not. At the end of the day, if I’m going to commit to having an always-on, internet-connected screen sitting on my countertop all the time, I want it to do more than the Echo Show."